In the summer of 2018, a federal grant of $91,000 from the Environmental Protection Agency (EPA), plus matching support of $30,000 from Baylor University, brought together Baylor scientists, science educators and local teachers in an effort to teach the next generation about water quality and reuse. A unique part of the EPA funding is the inclusion of sub-grants for participating teachers to request for conducting their own community service environmental project during the upcoming year. The teachers, through their school districts, may apply to obtain materials or equipment for classroom teaching and conducting service learning projects designed to build awareness and promote environmental literacy specific to wetlands issues and local water resources. The overall EPA project, Nesmith said, is designed to have an impact locally and connect educators with information about their community. 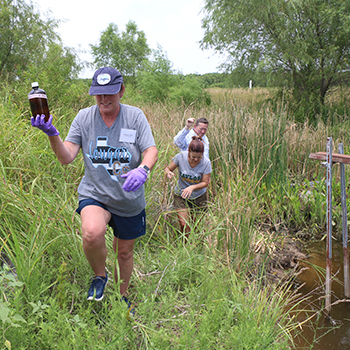 From July 30 through Aug. 3, 20 Waco-area science teachers from grades 4-12 participated in a field-based professional-development experience based at the Lake Waco Wetlands (LWW). The program – “Immersed in the Wetlands: An Environmental Academy for Educators” – will engage the educators in inquiry- and field-based environmental education methods, so they then can share those methods with their own students in local classrooms. Baylor scientists working on the project and serving as co-PIs on the grant include Nesmith; Bryan Brooks, Ph.D., Distinguished Professor of Environmental Science, College of Arts & Sciences; Chris Wynveen, Ph.D., associate professor of health, human performance and recreation, Robbins College of Health and Human Sciences; Cole Matson, Ph.D., associate professor of environmental science, College of Arts & Sciences; Bill Hockaday, Ph.D., associate professor of geoscience, College of Arts & Sciences; and Melissa Mullins, environmental education and outreach coordinator for Baylor Center for Reservoir and Aquatic Systems Research (CRASR), a partnership with the City of Waco. They are working in partnership with the Lake Waco Wetlands, a project of the City of Waco, which is directed by Nora Schell. 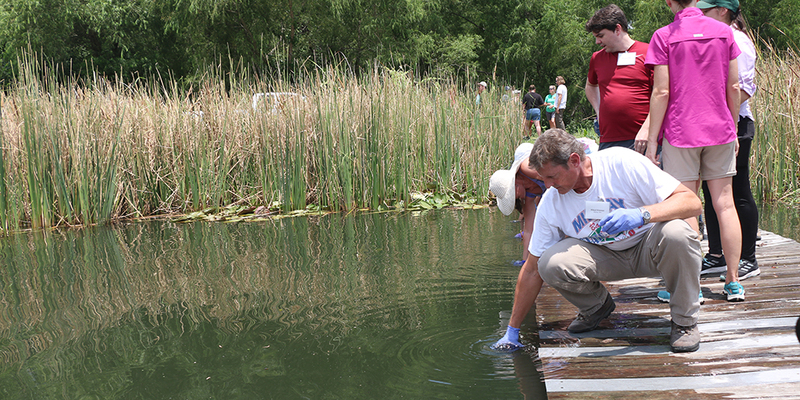 This cross-disciplinary group of Baylor faculty members and staff have collaborated before, beginning in 2012 with a project at the John Bunker Sands Wetlands in Dallas. Brooks and CRASR also partnered with Nesmith to add an educational component to a National Science Foundation grant in 2015. Brooks — who focuses significant research on water quality, water reuse and the development of science-based approaches to manage complex environment and health issues — said water issues in Texas are of great importance and the role of wetlands is vital. Brooks said that a robust educational effort is a “value multiplier” for scientific research and a key component in creating impact through research. The 20 teachers were chosen through an application process to participate in the workshop. They came from 14 area schools in five districts and one private school. With 12 teachers coming from SOE partner districts Waco and Midway ISD, Nesmith hopes that the experience also can have an impact on Baylor pre-service teachers who will be doing clinical student teaching in those schools and districts.